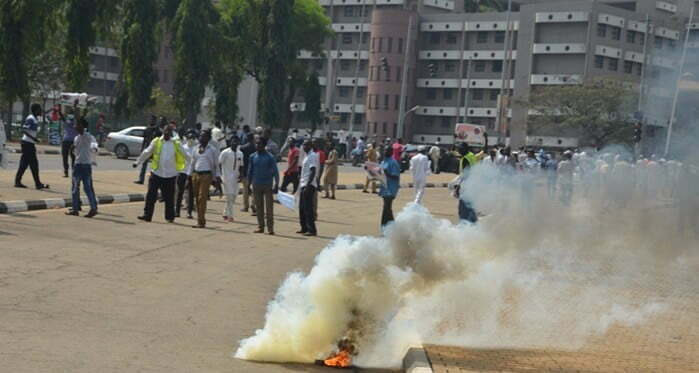 Members of the Islamic Movement of Nigeria, IMN, also known as Shiites, on Monday shut down the Federal Secretariat complex in Abuja. The youth were protesting over the continued detention of the leader of the sect, Sheikh Ibraheem El-Zakzaky. Chanting “Free El-Zakzaky, free El-Zakzay,” the Shiites, according to the Punch, chased away a police team and overturned a traffic warden cabin on the road. According to the report, the youth, who consequently took over roads in the area, were armed with stones. Na wao. Nobody has called on international bodies now to complain. When govt will do their own, we go dey speak grammar.